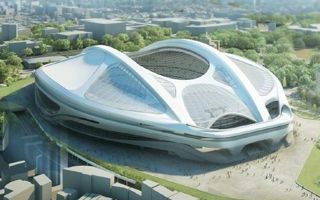 Japan Sport Council introduced the new, updated renderings of Zaha Hadid’s National Olympic Stadium. This comes as a response, at least partial, to mass criticism of the design. Although it also already earned the design a ‘bicycle helmet’ nickname, too. Compared the initial concept from 2012 the planned stadium lost a lot of its secondary infrastructure, altogether losing 20% of its size without capacity decrease. What’s gone is mostly the secondary infrastructure, like access ramp system that reached beyond the stadium’s plot. This was the part of the structure accused of wasting public space for impressive, but not effective matchday infrastructure. The vast roof of the stadium was also downscaled. Height difference is a modest one – down from 75 meters to 70, still a high-rise scale. But the roof’s size decreased significantly, not losing its retractable portion over the pitch. Similarly, the retractable stands weren’t left out. The stadium will still have 20 lowest rows (or 15,000 seats) moving to assure proper viewing conditions for various events. It’s best suited for athletic events, but with football or rugby the stands can move as close as 17,5 meters from the field. The giant floor area of 290,000 sqm is now down to 211,000 – still impressive, but not larger than some existing stadiums of this scale. But what remains higher than any other is the price tag. The latest, reduced budget is set at ¥162.5 billion ($1.6 billion / €1.17 billion), more than any existing stadium ever consumed. It still represents almost half the price set in black scenario estimations from 2013 (putting the cost at 300 billion) and nearly the desired initial plan of 130 billion.